The Center for Media and Democracy has been flagging Expedia’s financial support for ALEC and asking activists if they are using Expedia-connected hotel and air travel booking services. In an email to Common Cause, Expedia “confirmed it had severed ties” with the corporate bill mill. It is unclear whether Expedia funded ALEC as a one-stop shopping for state legislators to aid its corporate lobbying agenda or if there were specific bills Expedia’s lobbyists were backing through ALEC. At ALEC task force meetings, corporate lobbyists vote as equals with state legislators behind closed doors on “model” bills. ALEC laws change the rights of Americans and aid corporations and special interest groups. 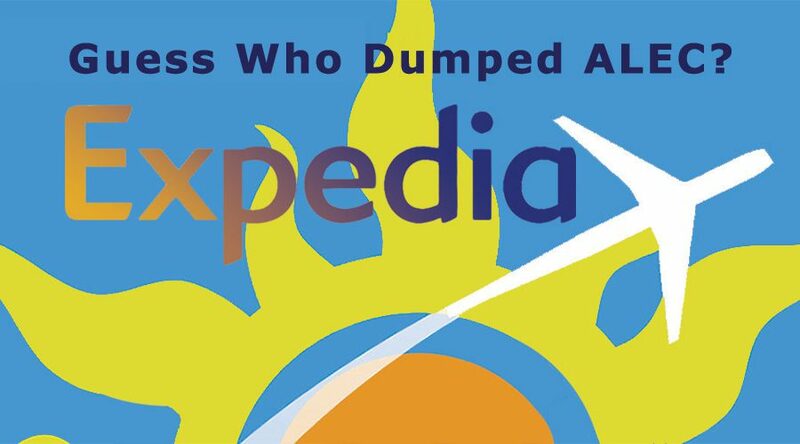 At the Netroots Nation 2016 conference in St. Louis in July, CMD expanded its efforts to help citizens encourage Expedia to dump ALEC through a postcard campaign. The postcards were mailed to Expedia’s CEO Dara Khosrowshahi and Chairman Barry Diller. Expedia joins AARP, Google, General Motors, General Electric, Walmart and more than 100 other corporations that have dumped ALEC since CMD launched ALECexposed in 2011, connected the dots between ALEC and the Stand Your Ground legislation, exposed ALEC’s role in fueling climate change denial, and documented how ALEC’s pay-to-play operations corrupt the American legislative process. Thank you for this story. It is nice to know, that some major Corporations, will no longer be using/supporting ALEC. The fact that it even exists should be criminal. If they didn’t own so many judges it would be! What proof or supporting documentation do you have regarding AARP and Expedia not contributing to Alec anymore? ?